The Designed for Better Learning program set out to create a new educational paradigm to reinvigorate public schools, addressing not only outdated school design, furniture and equipment, but also the lack of participation and involvement by students and teachers. The program also launched the first municipal-owned Maker Space in Greece. in the redesign of their school buildings, play yards and surrounding spaces, providing new opportunities for creativity and connection. Surveys after the program’s completion at each site show a marked increase in student and parent engagement and positive connections with their schools. Teachers were also able to engage students in more collaborative hands-on projects. 66% of teachers report better predisposed towards their school, while 43% experimented with alternative forms of teaching. A great step securing the program’s sustainability was taken in 2018, as the City of Athens committed 1.5 euros to the Maker Space and its dissemination activities for all residents. Read recent news items on Designed for Better Learning. The City of Athens' Maker Space is the first municipal fabrication lab in Greece, equipped with machinery and digital tools for designing, printing, and manufacturing. Laser cutters, 3D printers, CNC router, vinyl cutters, and more are available at the new City of Athens’ Maker Space - free for all Athenians to explore. An integral part of the Designed for Better Learning program, the Maker Space provides a hands-on experience in digital design and creation. Guided by the team of architects of the Transformable Intelligent Environments Lab of the Technical University of Crete, participants can envision and create their own tools, ranging from everyday tools to toys and educational equipment. 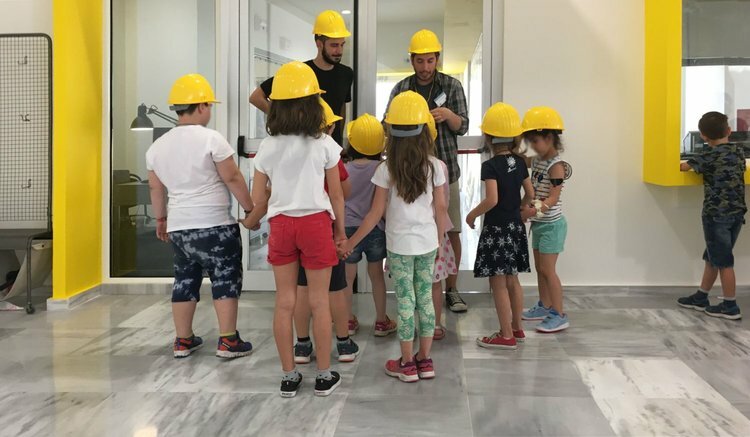 Since its re-opening at the Serafeio complex in 2018, more than 1150 children in Athens have already explored the Maker Space, learning about applied digital technologies through hands-on experiments. More than 220 teachers have also taken part in workshops – designed to help them create new tools to enhance school learning and introduce creative play in the classroom. “In Maker Space, children can see, for example, how simple objects are designed and produced. Their curiosity is naturally sparked as children begin to wonder ‘what can I dream up and construct next?’ Through the Maker Space, children are getting a first-hand experience of what it is to be an inventor in the 21st century". (Alexandros ambouroglou on GreekReporter.com). A great step towards securing the program’s sustainability was taken in 2018, as the City of Athens committed 1.5 euros to the operation of the Maker Space and its dissemination activities for all residents. These activities will include new “Educational Pla(y)ces” projects in even more of Athens public schools.